Generally, NAV translation refers to the translation of UI elements like captions and user texts (messages on dialogs, warnings, error messages). 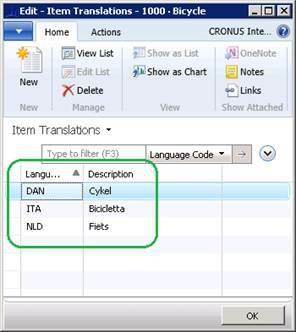 This translation is done by the Microsoft Dynamics NAV team before releasing the localized version of the product. But there is one more scenario. In this scenario, Cronus International Ltd., wants to sell a “Fiets” to a Dutch customer, a”Cykel” to a Danish one, and a “Bicicletta” to an Italian customer. All 3 are the same inventory item – and its default name is “Bicycle”. But for reporting, Cronus International Ltd. wants to use the customer language preferences for translating the bicycle’s name. Sometimes there’s a need to support multiple languages for domestic transactions, too. For example, Switzerland has 4 official languages: German, French, Italian and Romansh, the first 3 of them being supported by NAV. 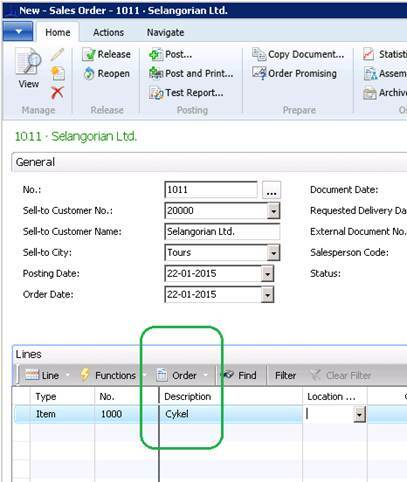 The example below uses the Item Translation feature of NAV, however, implementations of the same pattern exist for other application areas. 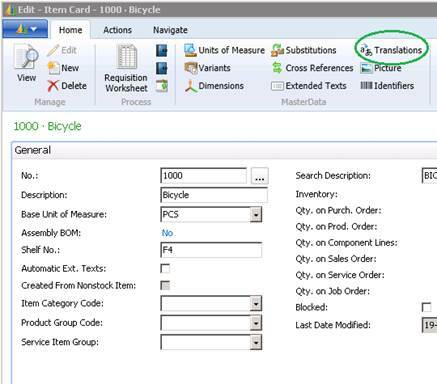 In the Windows client, on the bicycle Item card, on the Home ribbon tab, choose Translations. On the opened page, enter the Danish (language code DAN), the Italian (ITA), and the Dutch (NLD) translations for “Bicycle”. On the customer card for your 3 customers, in the Foreign Trade FastTab, choose the preferred language for each customer. 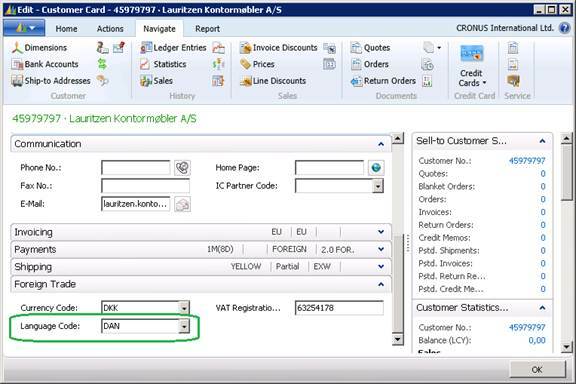 If no language is specified, then the default item description will be used for items sold or anyhow associated to that customer. If for example, the DAN (Danish) language is specified for the customer, and the “Bicycle” has a translation in Danish, then this translation “Cykel” will be used instead of the default name “Bicycle”. Named “<Entity> Translation” table, where <Entity> is replaced with the name of the actual object being translated. For the Item example above, this table will be named “Item Translation”. Entity ID field For example, Item No. Language Code Identifies the language of this translation string (for example, “DAN” (Danish), “BGR”(Bulgarian). This is one of the language codes defined in the Languages table. The table above has a key composed of the first two fields. Applies to document type Can choose which document types are affected. All document types are affected.